This summer we will take time to get to know nine of our teachers and three administrators at Jenison as we all enjoy a beautiful summer in West Michigan! Please join us each week to learn about their friends and families and how they plan to spend their summers recharging! This week we’re getting to know Michelle U’Ren a Fifth Grade Teacher at Pinewood Elementary. Michelle and her husband, Ryan, have two children: Landon and Madelyn. What does the end of the school year mean to you? The end of the school year is such a special time. It is so amazing to see how much my students have grown academically and personally throughout the year. It is exciting to celebrate their successes with them. I also love knowing that when they become sixth graders, they are the leaders of our elementary building. Saying good-bye at the end of each year is never easy. Over the course of spending nine months together, I form quite a bond with each child in my classroom. Each student touches my life in such a positive way. I am so thankful for email, social media, and the occasional visits that allow me to stay connected to my former students. Tell us about your family and/or the people you plan to spend time with this summer. I am looking forward to spending quality time with my entire family. My husband, Ryan, and I will celebrate our eleventh wedding anniversary this summer. We have two children. Six-year-old Landon loves sports and super-heroes, while four-year-old Madelyn spends her time keeping up with her brother, taking care of her baby dolls, and participating in all-things-princess. 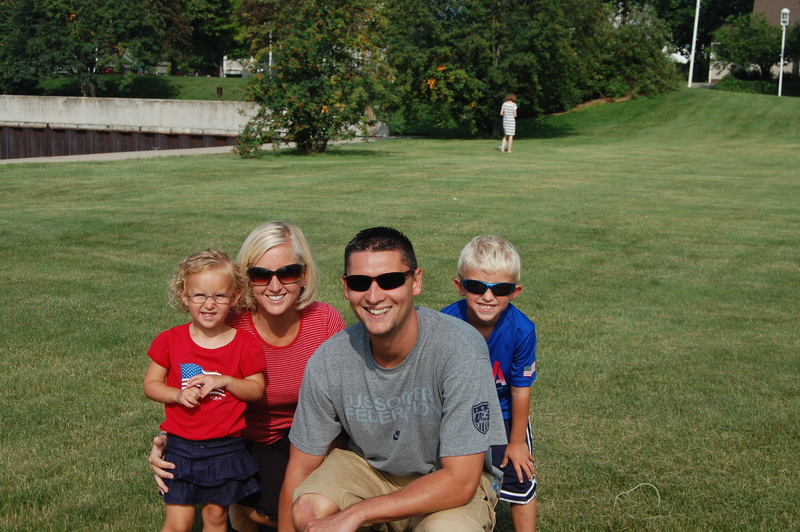 Michelle’s Family enjoying the Fourth of July last year. Summer time means fun in the sun and extra family time! We celebrated by playing on the beach, and watching fireworks in Grand Haven. We love taking family walks and bike rides. My kids love the sand and the water, so we spend a lot time at the beach. I know there will be many front-yard baseball and kickball games as well! We are also hoping to take our first family trip to Mackinac Island. There are so many books on my summer reading list! Summer is the perfect time for me to catch up on my own reading, but I also love to preview books for my students. It is so much fun to come back from summer vacation and be able recommend new books to my fifth graders! A few books on my list for this summer include: The Fault in Our Stars by John Green, The Maze Runner by James Dashner, Risked by Margaret Peterson Haddix, The Giver by Lois Lowry, and Sing You Home by Jodi Picoult. What are your two favorite things about working in Jenison? Jenison is the district I grew up in! I am a graduate of Rosewood Elementary and Jenison High School. Teaching here has always been a dream of mine. I love my job for so many reasons and working in Jenison really is extra special. I am so appreciative of the support I receive from so many parents. Whether it is volunteering their time in the classroom, donating items for a classroom holiday party, or helping to purchase supplies, the parents in this community are always willing to help out. I also love the people I work with everyday. Jenison has amazing educators and administrators who are willing to share materials, collaborate and support each other in any way possible. It is truly amazing to feel so supported while doing a job I love! She’s an incredible teacher, truly a blessing to pinewood and this community! She has a compassion and love for the children and goes beyond teacher dedication to ensure the overall success and well being of all students. Michelle U’Ren is wonderful teacher and role model. My daughter loved her Social Studies class. She was truly blessed to have her as a teacher. Pinewood is really lucky to have her on their staff.